Could Boise Be the Home of a New USL Pro Team? Today it was announced that St. Louis has been awarded an expansion franchise to begin play in 2015 of the fast growing men’s soccer league USL Pro. From what I’ve gathered this adds fuel to the fire that the Seattle Sounders of Major League Soccer will be forming their own USL Pro team for the 2015 season. My curiosity was provoked when I heard that Boise was mentioned as a potential city for the home of this new Sounders-affiliated USL Pro team. According to Sounders GM and part owner Adrian Hanauer, the list of cities being looked at include Bellingham, Everett, Spokane, and Boise. Then, on a fan poll at SounderAtHeart.com, the question was asked “Where would you like the Sounders to put a USL Pro team?” At the time of this writing, Boise is the overwhelming favorite, with 72% of the 1860 votes. This news could finally spur some movement on the new Boise Hawks Stadium, which has always been planned as a multi-purpose facility capable of hosting professional soccer and High School Football. There’s been little news or updates on this proposal since it was unveiled in 2011, which has me thinking they’re having trouble raising the funds. 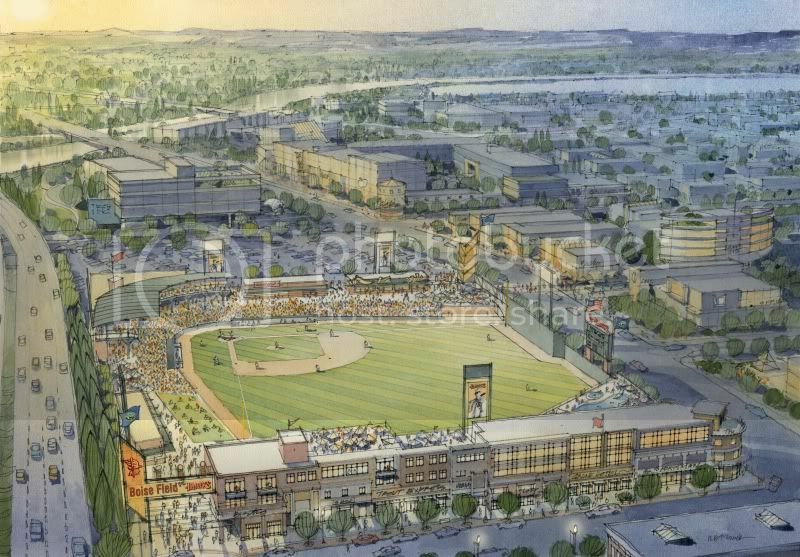 There’s no official word, but I’ve heard talk from multiple people that a competing proposal is being put together to build the new ballpark out in Meridian which would move the Hawks westward. Perhaps this new USL Pro team would join them. Kind of reminds me of the Atlanta Braves moving out to Cobb County. What would it be called? What would our mascot be? Our colors? I’m a designer by trade so this is my favorite part of sports. Ideally we’d steer clear of generic, meaningless names and infuse this team with a true local spirit. Let’s give this team a name that wouldn’t make sense in other places. Like… the Idaho Sawtooths, or the Boise Bluebirds… I don’t know, just throwing it out there. I’d love to hear your ideas! That’d be a pretty fun cadre of cities to play against. I clearly think Spokane would be the better option. 2. Minor league sports wise Spokane has always supported their teams better averaging higher attendances. Spokane Indian’s almost double Boise Hawk’s attendances and where Spokane turned an AFL2 team in to an AFL Champion team the next season Boise’s AFL2 folded. 3. Facilities: Joe Albi Stadium in Spokane is about 28,000 which is perfect where Boise’s real option would be Bronco Stadium and rights to the stadium would be filled with tape because of it belonging to Boise State. Don’t get me wrong Boise deserves a team but I have to admit Spokane is the better option for the Sounders. I think Spokane would be a good option, but I have to disagree on some of the facts Boisecenter mentions. In regards to CSA, according to the latest census data Boise CSA (which extends from Mountain Home to Ontario) is over 729,000 while Spokane CSA (which includes CDA) is just under 680,000. Keep in mind the reference was to CSA not metro (see census.gov). As for minor league sports, Spokane does a great job of supporting them. Boise does well with the hockey team, but could do a little better with our baseball team (facilities limited) as well as our NBA D-league team – something Spokane does not have. As for the Boise Burn, I think the fan support was there with an average attendance of over 4,500, the reason they folded was because the AF2 league disbanded and one of the major owners pulled out. I think BSU athletics has a role in some of this as a lot of money goes towards BSU football, where the average attendance is around 35,000 now. To highlight this, based on a USA Today report, Boise State athletic revenue was greater than Washington State. As for facilities, this is where we do fall short and we need to continue to push for improvements here. Though I don’t believe a 28,000 seat stadium is absolutely needed and that that kind of attendance would be expected or achieved in either city. Both cities I think would be a good choice, but I don’t think Spokane has a clear edge (though we do need to improve our facilities).The poll in the article really surprised me especially in the disparity between Boise and all the other locations and this leads me to think that if Spokane is clearly a better option we would have seen some of that reflected in the poll. So if you are mixing BSU in the context of private owned sports as far as revenue It would probably only be fair to mix Eastern Washington University in Cheney then Gonzaga and that would tip the scale in Spokane’s favor along side WSU. Head to head (can’t relate to baskeball because Spokane does not have a D-League but Gonzaga on national tv every week kills that need) every time Spokane has matched up to Boise in sports attendance figures Spokane was the clear winner check out figures for the Chiefs, Indians and when Boise did have a 4,500 attendance for AFL2 Spokane was thriving with a 9:500 attendance in of course I admit in a much much more modern and better facility. Having lived in both areas in my opinion Spokane would have a larger draw. Plus you neglected to indicate a more suitable field then Joe Albi which already housed a successful Spokane Shadow soccer team with impressive attendance numbers (So it has already been done). Boise’s sports facilities/convention facilities are less than impressive. The link to the polls were no longer valid so to crown Boise a winner would be premature. In the state of Washington, better facilities, and proven better attendance records says quite a bit when you are running a franchise based off the Sounders. Both areas have multiple colleges and minor league teams, as well as other sporting events, I realize that. I just don’t think that either city has an edge over the other in additional income to watch an additional franchise. I don’t watch much soccer and previously did not know much about Spokane growing up in Boise. My girlfriend and I are doing the distant thing as she is finishing up school at WSU in Pullman and her parents just moved up to Spokane from Boise last winter. I have to say WSU has done some great things with it’s stadium with a new scoreboard, operations building and suites. Being a Bronco fan I have to admit I was jealous not at the team at the stadium. As far as Spokane goes, I visited the stadium above for Crimson and Grey weekend and it was nice and could see it being a prime venue for soccer. On a side note I hope Boise get’s the team but I can see Spokane being a better option. It seems like one of the drawbacks of Joe Albi Stadium is its size. Based on current average attendance numbers (see: http://dohertysoccer.com/2013-lower-division-attendances/2013-usl-pro-attendance/ ), the upper maximum of what one could expect in either city is about 5,000 per game. And even that’s optimistic. It would be a struggle to create a lively, intimate atmosphere when you have 3-5,000 spread out over a 28,000 seat stadium. You could raze Joe Albi Stadium down to about 5-7,000 seats, but would there be support for that? I’ve wanted to see a USL expansion team in Boise for YEARS! Professional soccer is the quickest growing sport in the nation and we would be well-served to get in on it. Whereas boise would be a longshot for a p team from one of the big three sports leagues, it would be quite possible for Boise to be awarded an expansion MLS team 10-15 years from now if we have a well-supported USL team. That’s how Portland received the Timbers! 2. Anyone that thinks boise doesn’t have the fan base to support such a team hasn’t been around any of the numerous soccer complexes on a Saturday in the fall, spring or summer. There are tens of thousands of kids and teens playing soccer in this valley. More than basketball, more than baseball and I would venture a guess even more than football. The fans are here, they’ve been raised on the sport. I honestly expect and average attendance of 7500 to 10,000 is quite realistic (assuming the stadium isn’t built for a more modest number. 3.A new, combined-use soccer/baseball stadium might be the gem in a West Downtown redevelopment plan! I would love to see something like this anchor development in that part of Boise! It could help start a streetcar system (I could hope) through downtown and spur retail and restaurant development around west downtown. Anthony, where exactly was the proposed site of the stadium to be located in BOISE? All I can say is that it would be incredibly disappointing if this stadium was built in Meridian. Spokane’s busiest flight service to Seattle Alaska Airlines 409,000 passengers a year. Boise’s busiest passenger flight to Seattle: Alaska Airline: 186,000 passengers a year. Hotel Rooms in near proximity to downtown Boise Center estimated 1,000. Hotel Rooms in near proximity to downtown Spokane estimated over 1,500 not to include a 15 story 700 + room hotel currently under construction. Public Transportation Service: Spokane has more routes more busses more often and a better central hub. Tourism? Silverwood alone brings more in. As of 2012 It’ was estimated that of the more than 659,000 guests who visited Silverwood in 2012, 448,000 or 66 percent were visitors who spent about $79.5 million in the region. While people visit from all over, major markets include Seattle, Portland, Washington’s Tri Cities, Western Montana, Boise and Canada. People drive from all over the Northwest and stay in the area. @SOUNDERS Fan up above, I think when you quote attendance statistics about sports teams you need to take into account the venue where those teams play. Take into consideration that the Idaho Steelheads and the Boise Burn both played in the same arena that has a maximum capacity of 5,000 people. So when our hockey team averages 80% capacity throughout the season you know that a lot of those are sellout games. As opposed to the Spokane Chiefs who, with an average attendance of 6,100 only fills 50% of the house, that means that few of those games are selling out. Also, the maximum capacity of Memorial Stadium where the Hawks play is 3,500, so a 2,400+ average attendance is actually quite good. As is the Indians’ draw of 5,000+ avg for a ballpark with a 6,800 capacity. My point being, sometimes stats aren’t all they seem. For instance, I could say that Boise is better because we support BSU Football (the most popular sporting event in Boise) with an average home game attendance of 34,000+ while in Spokane only an average crowd of 6,000 attends Gonzaga Basketball (arguably the biggest deal in Spokane) games. OR, this past season, I could even make the argument that Boise supports our local basketball more than Spokane, considering that the average attendance for Bronco Basketball home games was around 7,000 compared with GU’s 6,000. Those stats wouldn’t, however, take into account that Bronco Stadium holds 36,000+ capacity, Taco Bell Arena has a 12,000+ capacity while the MAC in Spokane only holds 6,000 (and sells out every game). And I’m not exactly sure why Tourism is relevant to a hometown pro soccer team. Sure, maybe a handful of people in the stands would be tourists, but the majority of people at any sporting event are the hometown fans. That’s why the atmosphere is so good at a home game, because the attendees aren’t casual observers, but committed fans. I’m not saying that Boise is more deserving of a USL team than Spokane, just that I don’t find the stats you used to be helpful in making a comparison. I think some great stats to compare would be number of adults registered in rec and competitive soccer leagues in the area, as well as the number of college students and kids participating in club, school and rec soccer programs throughout the region. Those people, and their families and friends, already playing soccer in the region are the ones most likely to become fans of a new team. Soccer is a sport that you grow to love by playing, so local soccer participation stats would seem relevant. Other than that, maybe you could use local tv ratings for MLS and World Cup soccer games from each city as a gauge of interest. Also, whichever city is willing and able to finance and build a stadium would be a huge selling point (possibly the only point that would be important for the Sounders). Also, I don’t think Boise has much of a vested interest in Real Salt Lake. I hardly ever see people sporting their jersey around town or getting together for RSL games, nor are they rarely televised. Contrastingly, I see a lot of Timbers and Sounders gear around town and those are the most often broadcast games in this region for the MLS. Now, my own personal experience is not a statistic, but I can speak for the folks participating in the local chapter of the American Outlaws Fan Club of the US Men’s National Team, and say that most of those people are Sounders fans, followed by Timbers fans, and then followed by a general mix of random MLS teams supported by a few individuals OR a lack of interest in MLS in preference for EPL. Boise doesn’t typically associate itself with teams from Utah. Most Boiseans consider themselves part of the Pacific Northwest and are most often Blazers fans not Jazz fans. Sounders and Timbers fans, not Real fans. I think the idea of having a Sounders Pro USL team is very attractive, finally getting some people to come to this great small city. With the popularity of Soccer in the Northwest, Boise does in fact share some of that love. There are always people walking around wearing Sounders/Timbers/RSL apparel, and there are even more people who sport International team gear (Real Madrid, Barca, Man Utd, you get the point). I would hope that Sounders are already talking to City Officials about a new stadium, which would obviously be a double for the Hawks. I’m sorry, but short season Class A baseball alone I don’t think will get this stadium done, a renovation maybe to Memorial Stadium, but not a premium downtown stadium, there needs to be another use for it, soccer is the answer. As a die hard Sounders fan, I know my season tickets will be bought before the first kick. Hopefully, this can get done!!! Notice how I said History of “city sports” attendance not college athletics. And I was looking at it from a town perspective on how they support their teams population and facilities. I did not bring in college athletics because you could bring in both Gonzaga and WSU and Eastern WA in those figures but they are NCAA not city/privately owned affiliated. And yes ownership does take in to consideration city support for local city named teams Figures above just shows the city of Spokane has invested more in it’s facilities and that shows with the population of fans that attend. Certainly when the Boise Burn played they could of filled up more and were not capped seat wise with only 4,000 people along with the Idaho Steelheads. I understand Boise does not have an arena as nice as the Spokane Arena and the ballpark is way smaller in comparison but you can blame Boise on that one. I could even make the argument that Boise supports our local basketball more than Spokane, considering that the average attendance for Bronco Basketball home games was around 7,000 compared with GU’s 6,000. Those stats wouldn’t, however, take into account that Bronco Stadium holds 36,000+ capacity, Taco Bell Arena has a 12,000+ capacity while the MAC in Spokane only holds 6,000 (and sells out every game). Remember Spokane has Joe Albi stadium which had it’s field replaced not so long ago and the Sounders have played there before. So that is a huge selling point that Spokane already has the facility. Not sure if the measure for Boise’s new stadium is up, but a new stadium closer to downtown Spokane has also been in the talks but again, that can take years. As a Timbers fan I am disappointed in Vancouver, Seattle and Portland for being so selfish and keeping soccer for themselves as if they were a toddler holding the game and saying “No!” Especially Seattle who made a promising offer to many cities in the PNW for a soccer team and then pulling it back like an immature infant and saying “Mine!” How do you, the people of Boise and Spokane, feel about the Sounders final decision? I honestly hope this lame W2, S2 and T2 junk fades away in the next few years and the teams will move to nearby cities like Spokane and Boise. There is a myriad of cities up here that could support a soccer team to name a few: (excluding the ones I have previously mentioned) Bellingham, Everret, Tacoma, Vancouver (WA), Hillsboro, Beaverton, Salem, Eugene, Bend, Medford, Cour d’alene, Idaho Falls and maybe even Missoula. Good luck to Boise and Spokane for getting that soccer team in the future, I see a great future for these cities and the soccer fanbases that they can attain. I heard from a bird that the Timbers are planning to start up a T2 style team in Boise to complement their new affiliation with IYSA. Not sure what the timeline on that would be though.